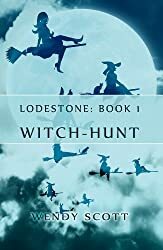 Lodestone by Wendy Scott is a magical tale of the woes of revenge and the trials of growing up. Sabrina is a young witch, a healer really, growing up in a nation next door to the magical hating Valloaria. But when she finds out she’s a decedent of Lauren, accidental founder of the magic killing Lauren’s Order, she knows she’s the only one who might be able to destroy the Lodestone, the rock that negates magic in Valloaria. Thrust into a quest across countries and into her own maturity, Sabrina must endure more than she’s ever had do before if she wants to save the people from the Order. The story line for this novel is great, however it is a YA book. More a young YA book, in my opinion. I had some trouble with the character development, as I never really felt connected to any of them. Still, the plot is gripping and I wanted to figure out how Sabrina fared against the powerful Order.